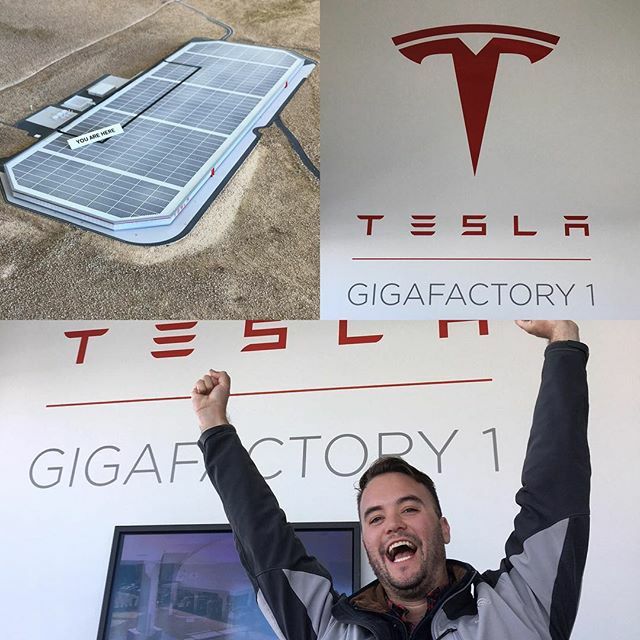 Recent pictures of Tesla’s Gigafactory 1 in Nevada have been scarce lately. We were getting regular updates via drone videos, but those stopped and were even taken down. We can’t say it was the cause, but the videos were taken down not long after two journalists from Gannett’s Reno Gazette Journal (RGJ) were involved in an altercation with two Tesla safety managers on the property, while they were trying to take pictures. We had a quick update in December with pictures by professional photographer James Lipman, but even some of those were taken down. Also this picture from Beaum Whiteman went under the radar for 3 months, but it seems that he got a tour of the plant and took a picture of an updated model of the factory which shows the completed section of the plant overlaid on top of the future 13 million sq-ft building. We recently discussed the fact that Tesla and Panasonic are are leading the almost 100 GWh of new li-ion battery cell production the industry plans to bring online by 2020. Tesla’s Gigafactory will be nearly 40% larger than expected, but the company has yet to update the production output since the unveiling of the project. Considering Tesla both increased the planned floor space and said that the project is more “space efficient” than initially expected, it would have been fair to assume that the planned production output is now more than the initial 35 GWh of battery cells and 50 GWh of battery packs, but CTO JB Straubel reiterated the figures during the Q4 conference call last week.